Respond to this post to claim them. These keys were found 12-14-2016 at the Flea Market. Reply to this post to claim them. Our cleanup crew found a set of keys today 08-29-2016 in the West field of the Flea Market. They may have been there more than a week. Call us If you can identify them. Someone lost a set of keys on the market grounds today. One of the keys was a car or truck key that has a computer chip in it. 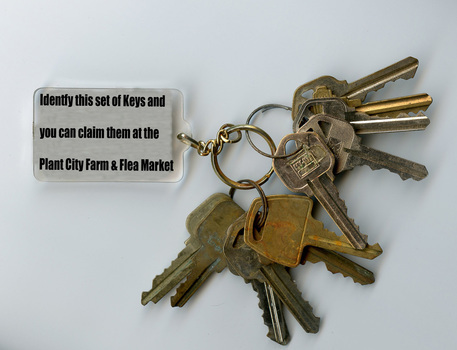 These keys are expensive (I'm told almost $100.00) If you know anyone that lost keys at the market in June, please tell them to get in touch with us. Preferably by email by going to our contact us tab, or call the office to get my personal phone #.